What is a negative externality? Appreciate the importance of knowing and understanding externality, an environmental economics concept, by reading this article. In environmental economics, one of the interesting and useful concepts discussed is externality. And I was reminded of this concept when I took a trip, together with friends and family, to Kitu-Kito. It is an ideal spot to spend quiet time or to commune with nature . The place can be accessed within 30-minutes of leisurely driving from the City of Puerto Princesa. 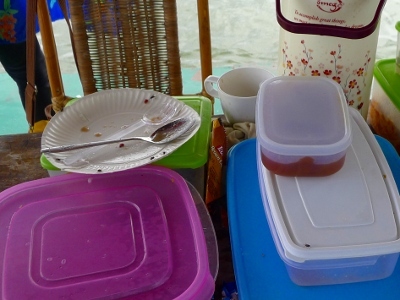 It’s a holiday so we thought of having a picnic on board a raft made of large PVC pipes that a motorized boat tows along a river towards the open, deeper parts of Honda Bay. We did a similar trip several months back—but without the flies. What reminded me of the externality concept? Well, I noticed an unusually large number of flies swarming at our food. We have to keep the food containers closed. I asked why there are so many flies that day. The pests somewhat curbed our appetite because we all know that flies are harbingers of many kinds of diseases. According to Penn State University (2014), flies transmit at least 65 diseases to humans. Flies leave pathogenic organisms in excretions upon alighting on food. This is disturbing as this would mean that we might ingest contaminated food because of flies landing on our meal and doing their nasty behavior of regurgitating or excreting things that we don’t want. Getting ill means lost work hours or lost opportunity to do other important things. Flies on plate after lunch. Just curious what could have caused this large number of flies to come and pester us, I asked the group if anyone knows why. Then our boatman said, “This happens every time those guys operating the poultry and piggery in the upland spray fumigants to get their farm rid of flies. “Ah, that’s an excellent answer to my question. ” I nodded indicating my enlightenment. Everybody new to the place sure learned something that day. Flies pestering our meals is a negative externality of fumigation. The externality in the foregoing short narrative are flies swarming the neighborhood when fumigants are in effect. They were not killed on the spot but escaped from the poultry and piggery farms. Their eggs and larvae must have been killed but the adults are scot-free—and posed danger to neighboring houses and, us, picknickers. The escaping flies that potentially bring diseases with them is a side effect of fumigation in the poultry and piggery farms. This is a negative externality that is not reflected in the cost of services involved in the operation of the farms. To internalize the externality or to correct the inequality in benefits as a result of the operation, the poultry and piggery farm owners should pay parties affected by their activities. They should pay us for lessened enjoyment of the sea scape and the cool breeze because we have to contend with the flies that pester our meals. How much should they pay us? This concern requires the conduct of a study. If we complain about the negative effects of the poultry farm, we should show the link between their operation and the unusual number of flies that affect third parties like us. Also, the owner of the farms should ask us and the neighborhood how much we are willing to accept as compensation for the nuisance. How do you write a good abstract? Here are four elements of a good abstract. Abstracts are important references for scientists or students working on their research proposal; particularly, in preparing their review of literature. The abstract describes an unpublished or published research study in capsule form. It is a brief overview of the investigation so that researchers are able to comprehend the content of the research quickly. The information provided in the abstract must be sufficient to help the researcher decide whether the work is relevant to his interest or not. It should be brief but not lacking in important elements necessary for understanding of the research conducted. The abstract will also help the researcher decide whether to read the research paper in its entirety or not. So how should the abstract of a research paper be written so that maximum benefit is derived from it? state the principal conclusions of the research. Generally, an informational abstract should give a brief summary of the main sections of the research paper, i.e., the introduction, the materials and/or methods used, the findings, discussion, conclusions, and recommendations. In some academic institutions or scientific journals, however, recommendations are not incorporated in the abstract. That is because anyone can make recommendations based on the conclusion/s of the study. The conclusion, in particular, should be given attention in writing the abstract. The conclusion should be well supported by the findings of the investigation; not a sweeping statement without any valid argument based on the findings to back it up. This is what really matters to the researcher trying to find gaps in knowledge that he can fill in. Normally, abstracts should not exceed 250 words but this number could vary depending on the prescribed number of words, say, when you would like to submit your research paper to a popular scientific journal. Brevity is emphasized. The limited number of words required for the abstract means that every word included in the abstract is necessary and that this should be presented in a coherent manner. Important information should fit into one paragraph so this requires a little bit of thinking challenge and practice to the beginning researcher. In what tense should the abstract be written? The abstract should be written in the past tense because the investigation has transpired. However, statement of facts in, say, the results and discussion and the conclusion, must be in the present tense. Finally, the references (e.g. name of author and date) should not be cited in the abstract unless the research paper involves an improvement or modification of a previously published method used by a researcher. For more information and tips in writing the abstract of your research paper, visit the online writing lab of Purdue University.